As the Supreme Court has recognized, social media sites like Facebook and Twitter have become important venues for users to exercise free speech rights protected under the First Amendment. Commentators and legislators, however, have questioned whether these social media platforms are living up to their reputation as digital public forums. Some have expressed concern that these sites are not doing enough to counter violent or false speech. At the same time, many argue that the platforms are unfairly banning and restricting access to potentially valuable speech. Currently, federal law does not offer much recourse for social media users who seek to challenge a social media provider’s decision about whether and how to present a user’s content. Lawsuits predicated on these sites’ decisions to host or remove content have been largely unsuccessful, facing at least two significant barriers under existing federal law. First, while individuals have sometimes alleged that these companies violated their free speech rights by discriminating against users’ content, courts have held that the First Amendment, which provides protection against state action, is not implicated by the actions of these private companies. Second, courts have concluded that many non-constitutional claims are barred by Section 230 of the Communications Decency Act, 47 U.S.C. § 230, which provides immunity to providers of interactive computer services, including social media providers, both for certain decisions to host content created by others and for actions taken “voluntarily” and “in good faith” to restrict access to “objectionable” material. Some have argued that Congress should step in to regulate social media sites. Government action regulating internet content would constitute state action that may implicate the First Amendment. In particular, social media providers may argue that government regulations impermissibly infringe on the providers’ own constitutional free speech rights. Legal commentators have argued that when social media platforms decide whether and how to post users’ content, these publication decisions are themselves protected under the First Amendment. There are few court decisions evaluating whether a social media site, by virtue of publishing, organizing, or even editing protected speech, is itself exercising free speech rights. Consequently, commentators have largely analyzed the question of whether the First Amendment protects a social media site’s publication decisions by analogy to other types of First Amendment cases. There are at least three possible frameworks for analyzing governmental restrictions on social media sites’ ability to moderate user content. Which of these three frameworks applies will depend largely on the particular action being regulated. 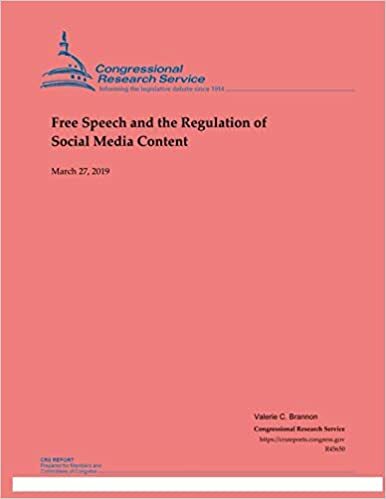 Under existing law, social media platforms may be more likely to receive First Amendment protection when they exercise more editorial discretion in presenting user-generated content, rather than if they neutrally transmit all such content. In addition, certain types of speech receive less protection under the First Amendment. Courts may be more likely to uphold regulations targeting certain disfavored categories of speech such as obscenity or speech inciting violence. Finally, if a law targets a social media site’s conduct rather than speech, it may not trigger the protections of the First Amendment at all.